Chicken Fajita Pita. This recipe is versatile – use whatever veggies you have on hand and whatever fajita toppings you prefer — just get a little creative! I don’t know about you, but sometimes it’s really easy for me to get into a boring routine when it comes to weeknight dinners. 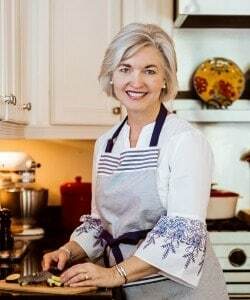 Just because I write a food blog doesn’t mean that I don’t get stuck in a rut sometimes, especially on weeks when work has been hectic and I arrive home too tired to get very excited about cooking dinner. 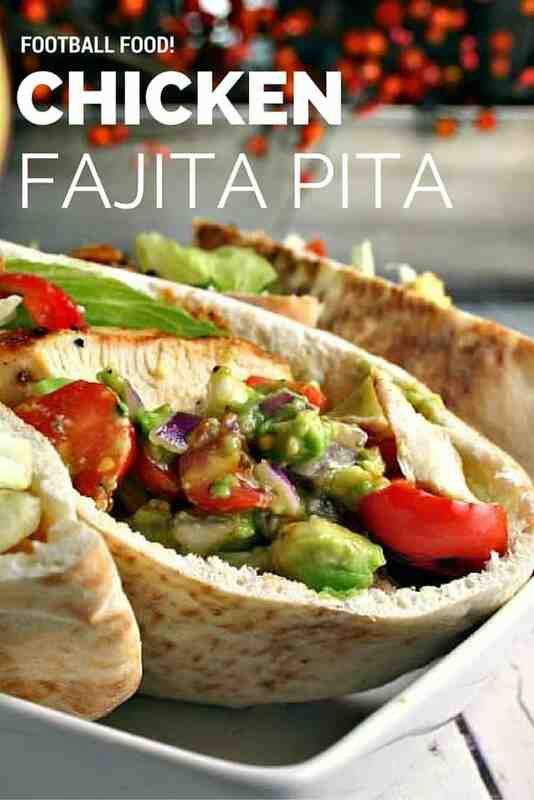 When that happens, I look for simple meals (trying to avoid copping out at the drive-thru) like Chicken Fajita Pitas. What I love about this dinner is that I don’t even have to turn on the stove! Season chicken breasts with a little olive oil and Weber’s Kickin’ Chicken spice then toss on the grill. Add a few sliced peppers and onions in a grill pan, then stuff it all in a pita pocket and eat! This recipe is versatile — use whatever veggies you have on hand and whatever fajita toppings you prefer — just get a little creative! Top with shredded lettuce, chopped tomatoes or jarred salsa, sour cream, cheese, taco sauce…you name it! I decided to top mine with Avocado Salsa, another quick and easy option. 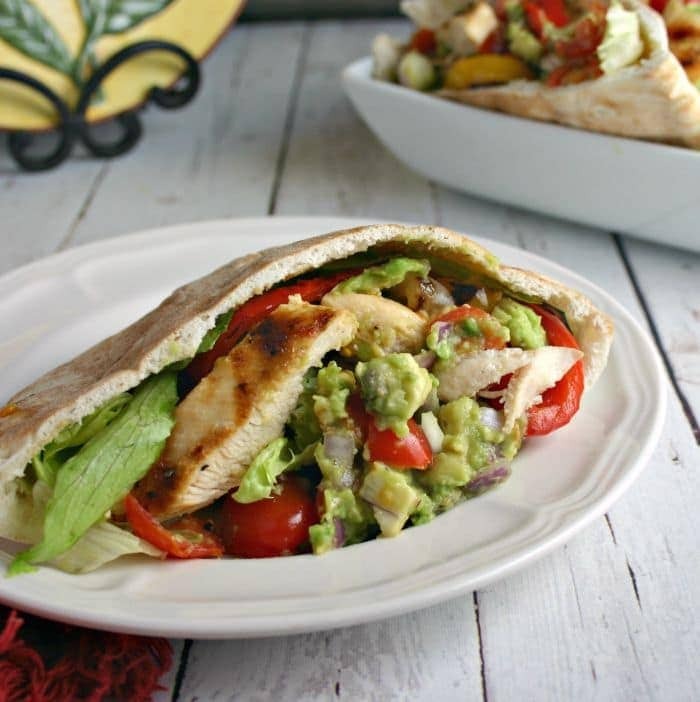 This creative and delicious pita would make a great option at your next football party or tailgate, too. 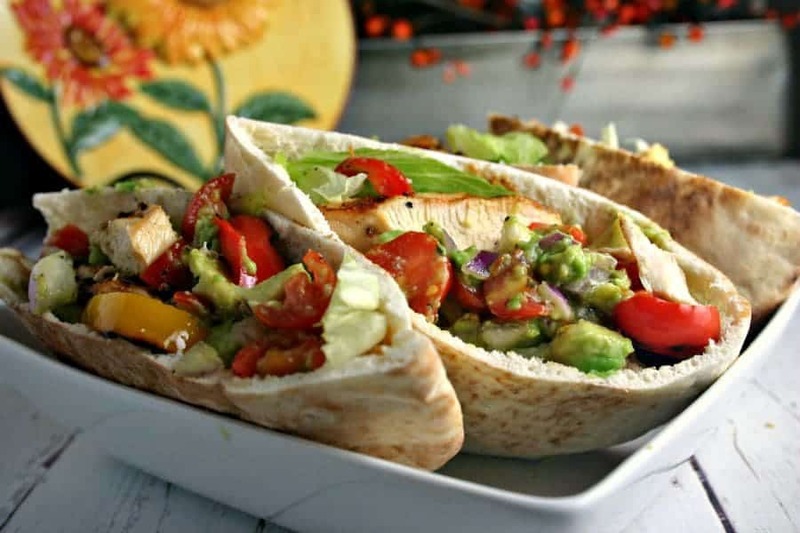 Chicken Fajita Pita. 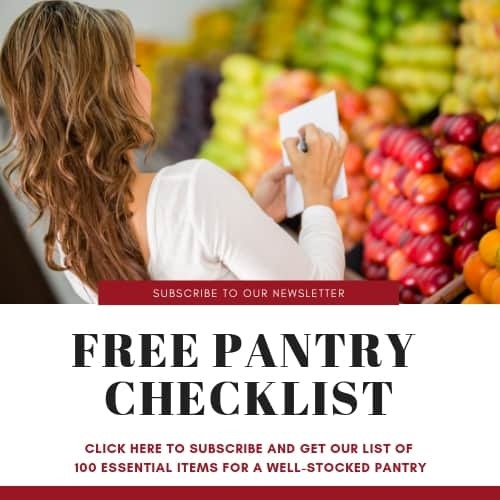 This recipe is versatile - use whatever veggies you have on hand and whatever fajita toppings you prefer -- just get a little creative! Brush chicken breasts with some olive oil, then sprinkle both sides with Weber's Kickin' Chicken spice. Use the amount for your desired heat -- more spice, more heat. Grill chicken until juices run clear, usually 15-20 minutes. Allow to rest 5 minutes, then thinly slice chicken..
Slice veggies and toss with olive oil to coat lightly. Place in a grill pan and cook until veggies are lightly charred and tender. 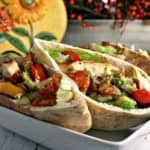 To serve, stuff pita pockets with chicken and grilled veggies. Garnish with lettuce and other toppings as desired.